1. John Karagounis, Antonis Kontopoulos and Stavros Theofilou assist Praxitelis Tzanoulinos. 2. 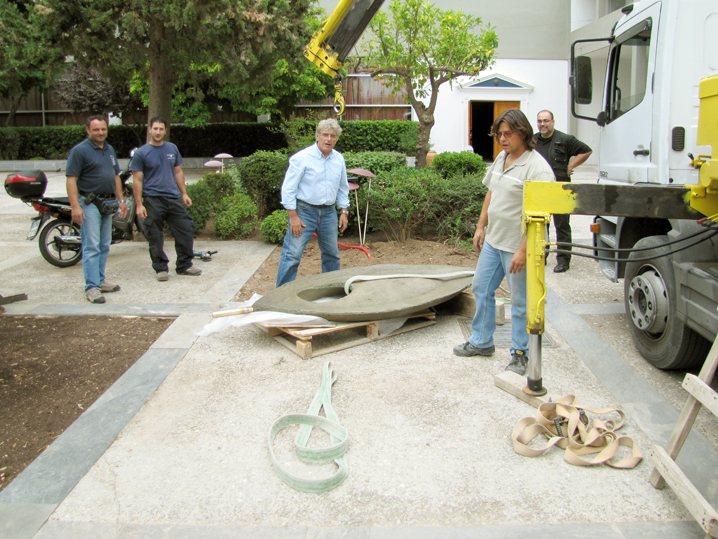 Praxitelis Tzanoulinos and Megakles Rogakos at the installation of Seed. 3. 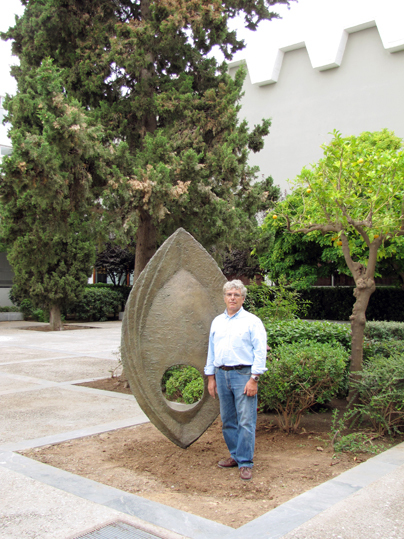 The artist Praxitelis Tzanoulinos with the Seed installed. 4. Praxitelis Tzanoulinos' Seed after landscaping at the atrium of Pierce College Theater. Praxitelis Tzanoulinos is one of Greece's most respected sculptors. Given the opportunity of a number of events organized by the College, Tzanoulinos had frequently visited the Agia Paraskevi campus in the past, and gradually a strong desire grew in him to have an artwork of his displayed there in the open. 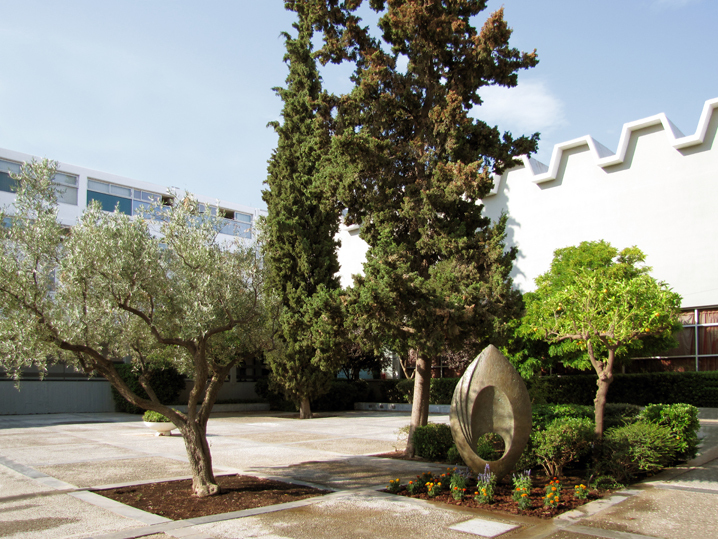 Having visited Tzanoulinos' studio in spring 2008 to collect his sculpture Eleni [TzaP1989elen] for the ACG Art Collection, I noticed at the space's rear a towering white sculpture. Mr. Tzanoulinos explained to me that this was a plaster study of Seed, a monumental sculpture that had not yet had the chance to be cast in bronze. He also thought that Seed would represent him very well in the ACG Art Collection, and he would be delighted to donate it to the ACG Art Collection. Finding its quality to be outstanding, I set myself the task to do all in my capacity to see this sculpture turn into bronze. Being impressed by ACG Art's Silent Dialogues exhibition in 2008, Mr. Vassilis Mouchtaris of Anaptyxiaki S.A., who has a significant art collection comprising works by Takis and Tzanoulinos, was convinced to want to make the necessary contribution of 15,000 € so that a bronze version of Seed could become part of the ACG Art Collection and be displayed amidst nature on campus. 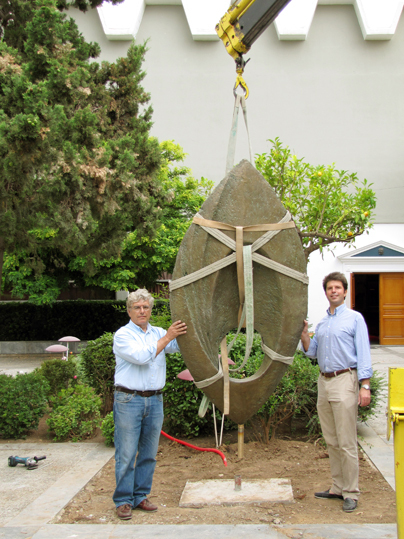 Indeed, with his letter dated 26 January 2009, Mr. Mouchtaris, commited to sponsor the casting in bronze of Seed. ACG President David G. Horner approved of the donation and Mr. Tzanoulinos met with me to identify possible locations wherein to install Seed. One prospective location was the garden in the vicinity of the Stadium. However, the ideal location turned out to be the atrium of Pierce College Theater, beautifully designed by Constantinos A. Doxiadis in 1965. As a matter of fact, Seed could take the place of a cypress tree there, which happened to perish earlier in the year. Therefore, on 24 June 2010 Praxitelis Tzanoulinos' Seed of 1990-2010 [TzaP1990seed] was beautifully installed at Pierce College Theater atrium. Its position, amidst olive, orange and cypress trees bring this sculpture in fertile dialogue with nature. Technical Services Director John Karagounis made sure to landscape the site especially for Seed and provided the sculpture with light so that visitors to the Theater may appreciate it at night. I wish to express my gratitude to Mr. Mouchtaris, who made this fine project possible!